The U.S. average retail price of diesel dropped 1.1 cents to $2.965 a gallon for the week of Jan. 21, even as crude oil prices increased by $2 per barrel compared with the week before. The drop in diesel marked the 14th consecutive weekly decline in the cost of trucking’s main fuel. The price has fallen 42.9 cents during that period. Diesel costs 6 cents per gallon more than it did a year ago, when the price was $2.905. The U.S. Energy Information Administration reported the prices Jan. 22 due to the national holiday the day before honoring Martin Luther King. Average diesel prices fell in all regions of the country except the Gulf Coast, where the average price rose 0.2 cent a gallon to $2.790. The California region saw prices fall just 0.3 cent a gallon to $3.739. West Texas Intermediate crude futures on the New York Mercantile Exchange closed at $52.57 per barrel Jan. 22 compared with $50.51 on Jan. 14. One analyst said the distillate, or diesel, margin is “just really good” — and that motivated refiners to make as much as possible. “Diesel supplies are not where they need to be for the market to be totally comfortable, but they have been building over the past several weeks. So that is probably keeping a lid on the upward momentum a little bit in [diesel] pricing even as crude oil moves back from those lows we saw in late December and very early January,” said Denton Cinquegrana, chief oil analyst at Oil Price Information Service. We're between seasons on RoadSigns but have created an intersession season as we christen 2019. In Episode 2, we ask: Is Trucking Charging Toward an Electric Reality? Could what’s happening at the ports of Southern California have consequences for the way the rest of the nation experiences an electric future? Listen to a snippet above from Volvo's Keith Brandis, and get the full program by going to RoadSigns.TTNews.com. One fleet executive is guiding his trucks away from diesel in California, the state with typically the highest average price for that fuel plus increasingly stringent emissions regulations. Less reliance on diesel fuel “is something we are mindful of, and what the state government would like to see. We are trying to be at the forefront and be compliant as quickly as we can,” said Peter Wang, CEO of Overseas Freight Inc. The Long Beach, Calif.-based drayage company operates 120 power units, most of which use diesel, but 11 are powered by liquefied natural gas, including six from an earlier grant in 2010. Most recently, Overseas Freight bought five Kenworth T-680 trucks outfitted with the new Cummins-Westport near-zero ISX12N natural gas engine. The California Air Resources Board has certified the engine as reducing smog-forming nitrogen oxides emissions by 90% compared with the current engine standard of 0.2 gram per brake horsepower-hour. “Natural gas trucks are expensive [to buy]. A lot more expensive than diesel. Without the grant money it would, financially, be a very difficult task to take on on our own,” Wang said. It has grants for another 18 natural gas trucks. “In the next round, if we see the specs we ordered are working well for us then we’ll get more. Or if we see we need a bigger tank, we can make changes,” or possibly shift to compressed natural gas, Wang added. Overseas Freight has contracted for renewable natural gas through the Clean Energy Fuels Corp.’s Redeem $1 deal, which guarantees a fixed fuel price of $1 per gallon for a year. At the same time, Overseas Freight averages about 150 gallons of diesel per truck per week, and has an account at a local truck stop. 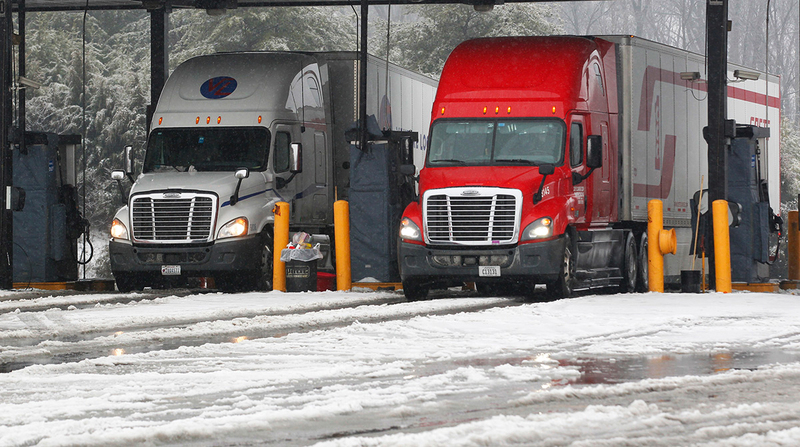 One large truckload carrier during a fourth-quarter earnings call noted that it paid little attention to whether the direction in fuel prices was a tailwind to earnings, implying its fuel surcharge balanced out the price swings. “Frankly, I don’t even know what the direction is, because we always consider it a wash when it all comes out. So, if we were chasing it, it would have been a headwind and if we get ahead of the curve, it would have been a tailwind for the short period of time,” Terrence Matthews, president of J.B. Hunt’s intermodal business unit, told analysts. Meanwhile, the International Monetary Fund became the latest organization to point to slowing growth here and in other developed countries, which could reduce demand for diesel. The IMF’s blog on Jan. 21 noted the U.S. expansion continues, but the forecast remains for a deceleration with the unwinding of fiscal stimulus. The group noted that a protracted shutdown of parts of the U.S. federal government poses downside risks, as does an escalation of trade tensions and a worsening of financial conditions amid high levels of private and public sector debt in countries.